A backpacker’s dream. A pristine environment. The land where time stood still. These are just some of the words that come to mind when we think of Laos, officially the Lao People’s Democratic Republic (Lao PDR). According to Wikitravel the true meaning of PDR is Please Don’t Rush – an apt description of the pace of life in this nice, laid-back country. Already earning something of a cult-like status among tourists mainly because of its easy-going pace and its ability to retain traditions that have almost disappeared from the rest of the region, Laos is rapidly moving out of its isolation today. Buddhist monks in Vientiane. Buddhism is very much a part of everyday Lao life. We had the chance to visit Laos seven years ago as part of our work. Our trip took us to the capital Vientiane. Even in this city, life was simple and relaxed - a welcome reprieve. Located along the mighty Mekong River, Vientiane was featured in the New York Times in 2008 as the top place to visit for that year. It’s a city of rustic charm with a variety of places to see. Temples, Buddhist stupas and monuments, crumbling French mansions, bougainvillea-lined streets and delightful food stalls adorn this small city of less than a million people. The Haw Phra Kaew or Temple of the Emerald Buddha is one of the more famous Buddhist temples in Vientiane. This temple was originally built in the 16th century to house an emerald Buddha image but some 200 years later, invading Siamese sacked Vientiane, destroyed the Haw Phra Kaew (since then restored) and carried the image with them to Thailand where it now rests at the Wat Phra Kaew in Bangkok. A somewhat unassuming monument is the That Dam or Black Stupa. Originally covered in gold it is one of the most popular ones in town. We just happened across this stupa on our way to lunch in one of the number of restaurants located around it – and which also happens to be within walking distance of the city center. 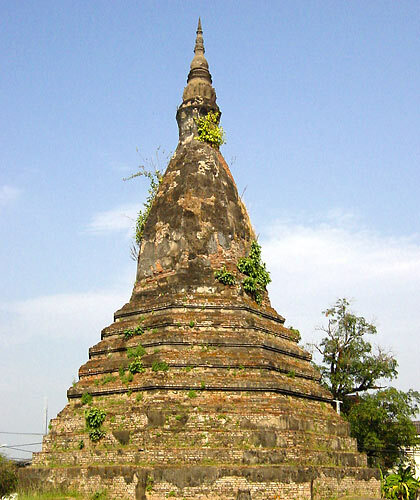 The That Dam or Black Stupa in Vientiane. 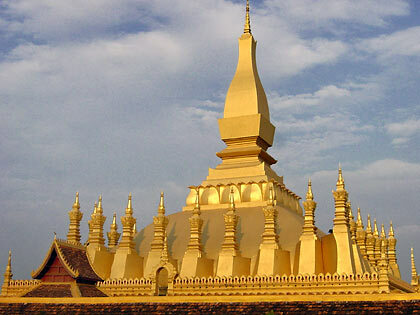 Probably the most famous site in Vientiane is the Pha That Luang, a Buddhist stupa in the center of the city and the most important national monument in Laos. It has even replaced the hammer and sickle on the state seal. 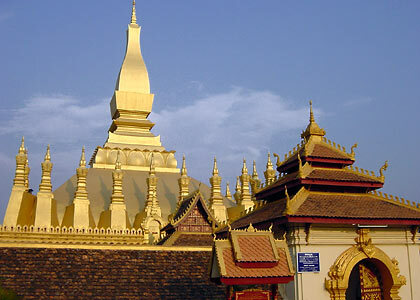 A gold-covered stupa 45 meters high, the Pha That Luang was originally built in the 16th century and has undergone many reconstructions since due to foreign invasions. 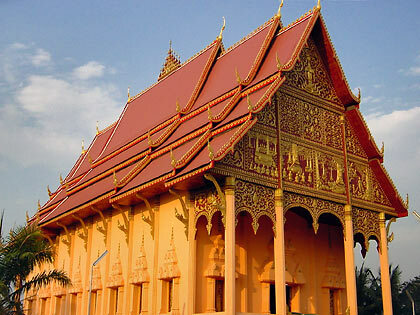 The Pha That Luang shows off its golden colors. Another famous monument is the Patuxay, built in the 1960's to commemorate Lao independence from France. One look at this monument and you’ll know for sure that it was patterned after the Arc de Triomphe in Paris. The design incorporates traditional Lao art, however, a fact that becomes even more apparent as one climbs to the top of the monument where the interior is decorated with Lao motif including a mythical bird. The top of the Patuxay also offers an excellent panoramic view of Vientiane. There were no malls in Vientiane when we last went there but the Talat Sao Morning Market in the center of town is not just for vegetable vendors but also includes restaurants and shops that sell clothing, jewelry, CDs and DVDs, houseware and appliances. (We first tasted fried ice cream at Talat Sao.) We’ve heard that a new shopping center has opened right beside this market but during our visit this was the shopping center of the city. Dining is a delightful experience in Laos. The local cuisine is tasty and includes plenty of fresh vegetables. Our first meal in Laos was a noodle soup filled to the brim with vegetables and various kinds of meat and served in a huge bowl that could easily have fed two people. Lao cuisine is very much related to Isaan or northeastern Thai food and includes plenty of raw vegetables, chili and sticky rice. The latter is often eaten by hand from small baskets. Vientiane also has several European-style cafes and bakeshops. Much of it is French obviously, but Swedish and other European cuisine are also available, all of which makes for a pleasant gastronomic experience in the capital. We recently watched a Lao cook with his Australian wife demonstrate how to cook ants’ eggs on TV. We learned later that some folks back here in the Philippines also used to gather and cook this source of protein. One of them remarked that the eggs tasted very much like cooked coconut milk. Unavoidably, some of the red ants do get included in the dish as it is virtually impossible to remove all of them completely. (They’re a little bit sour but otherwise okay, as a Filipino friend remarked recently when asked about how the ants tasted.) Gathering the eggs with swarms of angry red ants fiercely defending their domain is bound to be an exercise in masochism but which probably makes eating the eggs and the ants later a very rewarding experience indeed. 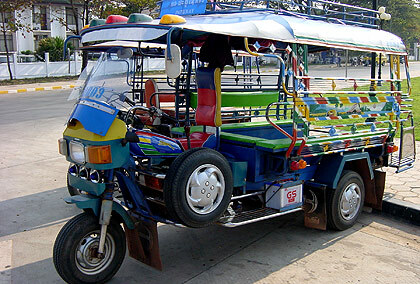 The Lao version of a Thai tuk tuk. 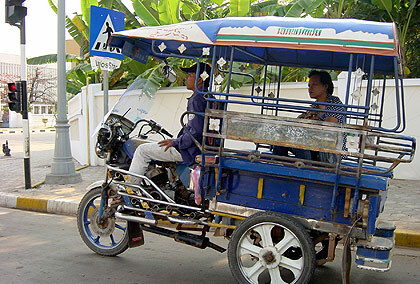 Vientiane is just one of the many attractions in Laos. Luang Prabang, a UNESCO World Heritage site is home to numerous centuries-old monasteries and temples, colonial-era architecture, night markets and saffron-robed monks moving silently among the temples. It’s a must-see place if you’re touring Laos. Champasak is another UNESCO World Heritage Site with Angkor-style Khmer temples. Natural attractions include caves and waterfalls near Thakhek, the waterfalls at the Bolaven Plateau, the Irrawaddy dolphin and Khone Phapheng Falls at Si Phan Don, others. One can also trek and visit the hill tribes in Phongsaly and Luang Namtha.